At long last conceding electoral victory to Aung San Suu Kyi the military regime has handed over government to people's elected representatives who were sworn in as members of Myanmar's bicameral parliament. Some 600 members, including about a hundred former political prisoners, took oath of office on Monday amidst an air of hope and despair - hope that they would introduce institutional reforms to strengthen democracy and despair that they won't be able to elect Suu Kyi as president of the country. Under a Suu Kyi specific constitutional mandate anyone having foreign husband and/or children cannot be elected president of Myanmar. Reports that she was in touch with military to remove this ban have been quashed, proving right her premonition and hence her oft-quoted decision to govern from behind the scene. 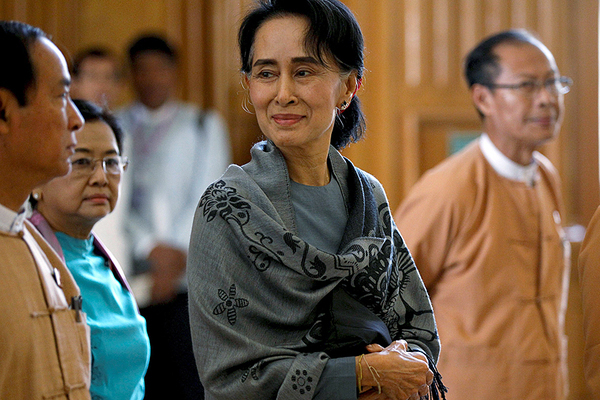 And that she will, given it is she who won her National League for Democracy 80 percent of the contested seats, with overwhelming support of Myanmar's ethnic minorities who constitute 40 percent of country's 51 million populations. The sitting president, Thein Sein, a general-turned-politician, will step down in March and NLD nominee will take over. But, as Washington said in its congratulatory message, 'impediments remain to realisation of a full democratic and civilian government'. The military will not only retain 25 percent of seats in the newly-elected parliament - just as ex-president Suharto had Golkar party in the Indonesian parliament - but also some key ministries. But expectation is that finding itself increasingly a pariah in the emerging democratic ambience world over the military rulers would like to keep a low profile, just as they have over the last few years. Be it in Africa or Latin America, and now in Myanmar, the young, nascent democracies' inheritance from the monolithic dictatorial regimes is invariably a bitter harvest of outstanding problems and 'swept under the carpet' unresolved issues and disputes. Of course, they inherit strong centres, concentrated powers tucked away and insulated from mainstream at places like Naypyidaw, as they often are, but nothing concrete in terms of institutions and systems. So will be the case for Suu Kyi. Her most formidable challenge is going to be picking up a president, who should not only remain loyal but also act as a puppet, which is a risky proposition given enormous powers that rest in the office of president of Myanmar. She would be also obliged to keep the military in good humour. Under the constitution, three key ministries - home affairs, defence and border affairs - remain under the control of the army chief. Home affairs include administration and border affairs deals with minorities' heartlands - both without which the elected government would not be able to introduce institutional reforms and bring ethnic minorities to beat their swords into ploughshares by joining the national mainstream. The Rohingya Muslims did not vote for Suu Kyi's National League for Democracy candidates - because they had no votes. Thanks to her predecessors' apathy who didn't want to run afoul of ethnic Rakhine Buddhists majority and had declared the Rohingyas illegal immigrants and deprived them of their basic human and political rights. The world expects of the Nobel laureate to restore Rohingyas' citizenship and offer them equal opportunity even if it enrages the Rakhine Buddhists. Rohingyas have been citizens, even rulers, of Myanmar, formerly Burma, for centuries. Currently thousands of Rohingya Muslims are trapped in kind of concentration camps. Who should know their pain better than Suu Kyi who spent 15 years in house arrest.